Ginger has been used as a medicinal herb for over 2,000 years, particularly in Asia, India and Arabic countries, according to the University of Maryland Medical Center. Ginger is available in capsules and tinctures, but you can also use fresh or powdered ginger in cooking or use the fresh root to make a tea. Don't exceed more than 4 grams of ginger per day, or 1 gram per day if you're pregnant. Like all supplement manufacturers, companies that make and sell ginger supplements aren't required to prove that the supplement is safe or effective, so always talk to your doctor before altering your diet significantly or adding any supplements to your regimen. Ginger is most often used as a natural remedy to help combat nausea and vomiting from motion sickness, pregnancy and chemotherapy. Ginger may help reduce symptoms of motion sickness, though other medications may be more effective. For example, a 1985 study found ginger was more effective at treating motion sickness than a placebo, but a subsequent 1991 study published in "Pharmacology" showed no discernible benefit to ginger for motion sickness. Ginger may also help reduce morning sickness symptoms in pregnant women. Cancer patients undergoing chemotherapy often experience nausea and vomiting as a side effect of treatment. In some cases, ginger may help reduce nausea in chemotherapy patients. In some cases though, ginger may make symptoms worse. 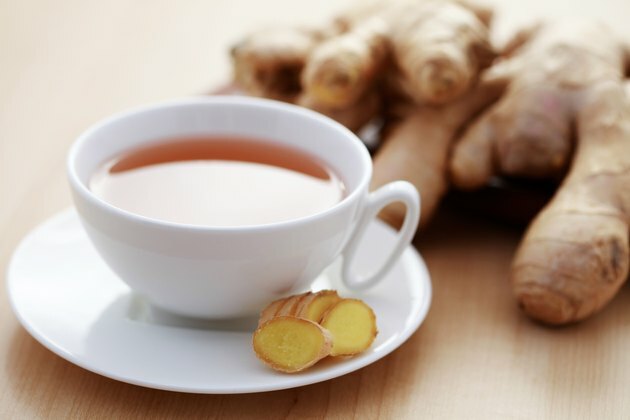 For example, a 2009 study published in "Supportive Care in Cancer" found that patients who received ginger with aprepitant, an anti-nausea drug, had worse nausea than participants who took a placebo and aprepitant. Ginger extracts may help reduce inflammation, leading to less pain for osteoarthritis patients. A 2001 study published in "Arthritis and Rheumatism" found that patients with knee pain resulting from osteoarthritis experienced less pain after taking a ginger extract twice daily for six weeks. It can take several weeks for ginger to work to reduce inflammation, advises the University of Maryland Medical Center. Ginger combined with feverfew in a tablet placed under the tongue may help reduce migraine pain in patients who experience a mild headache as a precursor to a migraine. A 2011 study published in "Headache" found that more patients who took a sublingual with feverfew and ginger at the onset of a mild headache reported reduced or eliminated pain after two hours than patients who took a placebo. It is unknown whether ginger on its own is effective for treating migraine pain. Ginger is generally safe for most people, but there are possible side effects and complications. 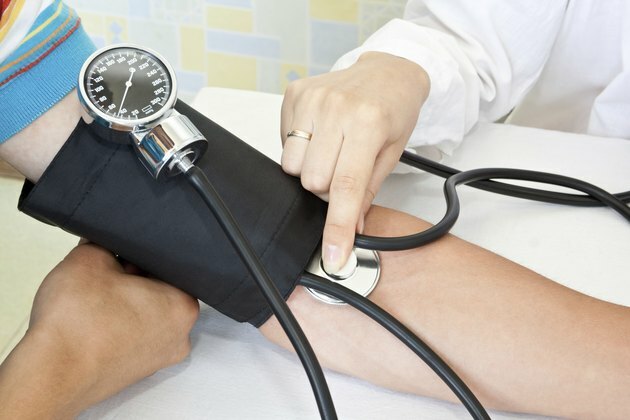 The most common side effects are heartburn, stomach upset and diarrhea. These side effects can be reduced in some people by taking ginger with a meal, according to the University of Maryland Medical Center. Talk to your doctor before using ginger if you're on blood thinners, diabetes medications or medications for high blood pressure. Ginger can increase bleeding, and blood thinners make this risk more of a concern. 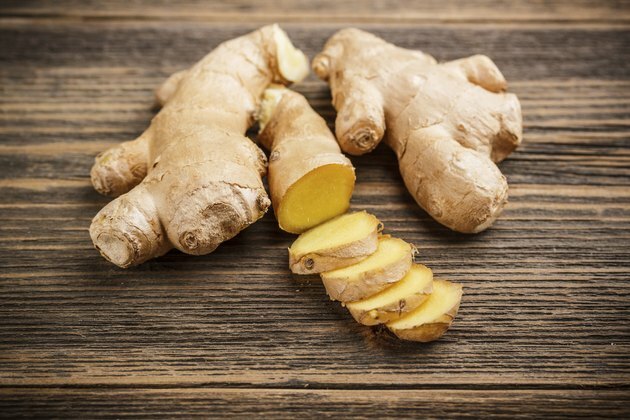 The herb can also lower blood sugar and blood pressure, so if you're on other medications that have these effects, using ginger could lower your blood sugar levels or blood pressure to potentially dangerous levels.